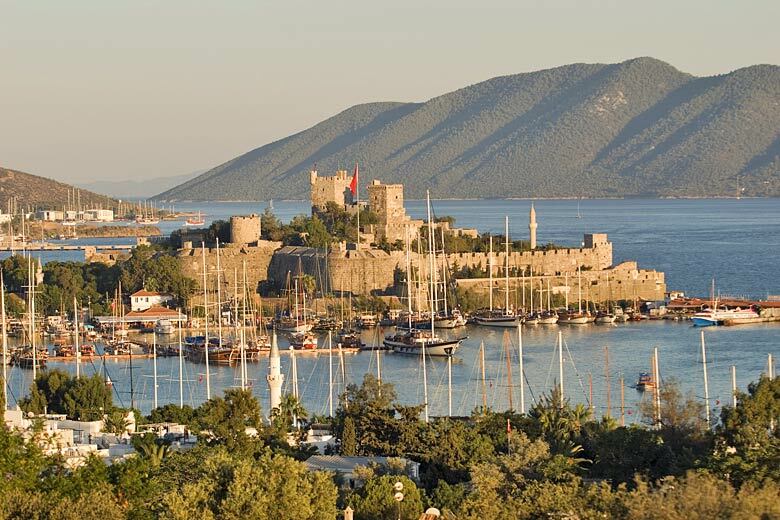 Going to the Bodrum & Izmir Coast? Find the best month to visit the Bodrum & Izmir Coast based on the weather. Check the Bodrum & Izmir Coast weather averages before you book your next holiday in 2019/2020. Today's maximum temperature in the Bodrum & Izmir Coast is expected to be 70°F, while the average maximum temperature in April is 68°F. The holiday weather guide shown above is for Bodrum. The weather for Bodrum & Izmir, represented by Bodrum, shows long term weather averages processed from data supplied by CRU (University of East Anglia) & today's weather forecast provided by MeteoBlue. Find out more about our data sources. Bodrum weather is perfect for beach holidays in the summer, but it can also be a superb antidote to cold dark Northern European winters, with its average of 5 hours of sunshine a day in December and January. The Bodrum and Izmir Coast in southwest Turkey, also known as the Aegean Coast, runs from Izmir in the north to the Gulf of Gokova in the south, where Bodrum and the popular nearby holiday resort areas of Gumbet, Ortakent, Turgutreis, Gumusluk, and Yalikavak are all located. The whole coast faces southwest on to the Aegean Sea. Bodrum has a lot of sunshine in the summer - over 12 hours a day on average in June, July and August, and it is also fairly hot. Daytime temperatures can easily reach well into the thirties Celsius in the hottest months from June to September, and have been known to exceed 40°C in July. Heat and humidity are also high in July and August which some people may find uncomfortably hot. There is also little chance of any rain from the middle of April to mid October, so like many other holiday destinations in the Mediterranean during summer the vegetation and landscape become quite parched. One of the main attractions in this whole area is the beautifully indented coastline and crystal clear waters. The beaches are not noted for their fine sand but there are many small, often shallow coves that provide excellent opportunities for swimming and other kinds of water sports especially windsurfing. Sea temperatures between July and September reach a maximum of about 24°C, a refreshing contrast to often baking afternoon air temperatures. In the summer, particularly during July and August, Bodrum also benefits from the cooling effect of Meltemi winds that blow up during the afternoon from the north or northwest. These winds help to dispel some of the heat and humidity, and are much loved by windsurfers as well. Summer ends at the end of September and from the middle of October daytime maximum temperatures rise only into the mid twenties Celsius. There is a greater chance of rain as every autumn day passes however sunshine still dominates the Bodrum weather with 72% of daylight hours being sunny usually in October and 60% in November. By the end of November temperatures overnight begin to fall below 10°C and during December and January there is more rain than in any of the other months. 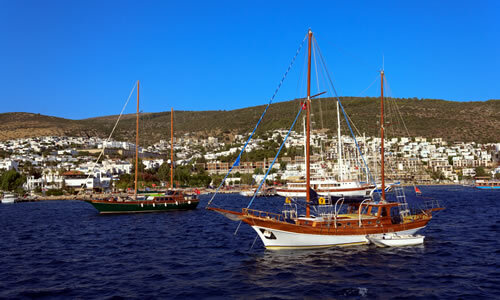 In fact 75% of Bodrum's annual rainfall occurs from the beginning of November to the end of February. But the sun still shines a lot; in December and January there are 5 hours of sunshine a day on average. At the same time maximum daytime temperatures hover around the mid teens Celsius. By the middle of March there is noticeable less rain and more hours of sunshine. April and May are beautiful months especially if you enjoy trekking or cycling; daytime temperatures typically are in the low to mid twenties Celsius. However it is a bit early for swimming. Sea temperatures do not rise above 20°C before the end of May. Bodrum has something for everyone in every month of the year. Some visit during the winter to escape from northern Europe. Others like the spring and autumn because it is less crowded and not so hot. But there is also something to be said for cloudless days and lazing by the beach in summer. Light cotton clothes are ideal for the summer in Bodrum from the beginning of June to the end of September, even for evenings. At the height of summer from June to August the UV is very high and precautions must be taken against sunburn. From September an extra layer may be required after dark, and by the middle of November it might be an idea to have an umbrella to hand. From the beginning of December to the end of March on days when the sun is not shining you will probably be glad of a sweater. Bodrum weather can be cold at times. Check Bodrum & Izmir Coast holiday weather averages for a particular month by selecting from the list below. Monthly weather guides include figures for temperature, rainfall, sunshine hours and sea temperature plus daily sunrise & sunset times. Below the Bodrum & Izmir Coast weather chart shows maximum daytime temperature for Bodrum and Izmir Coast, Turkey (Bodrum) and the USA (Washington). For more weather parameters or to change the destinations shown visit the comparison weather tool. Below are average maximum temperatures at popular destinations in the Bodrum and Izmir in April. Select a destination to see the weather overview and compare average conditions with today's forecast.